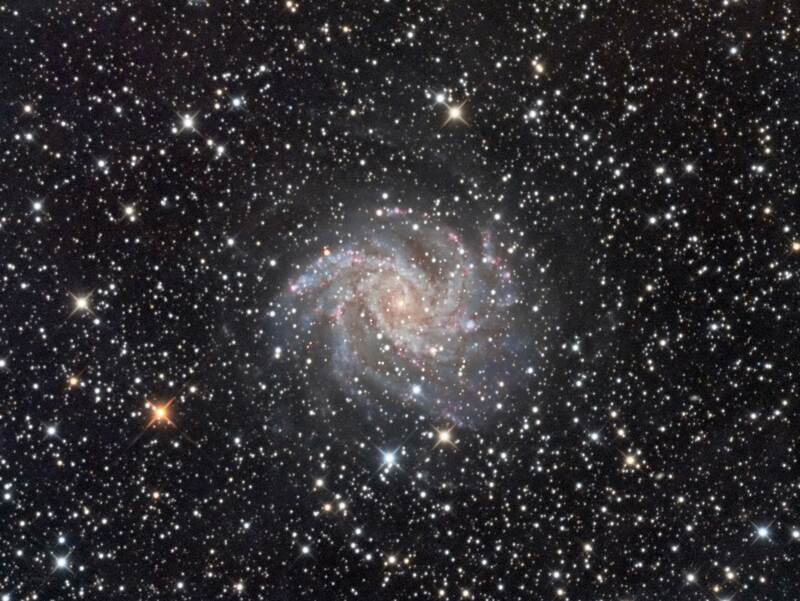 NGC 6946, the Fireworks galaxy, is a spiral galaxy in the constellation Cepheus. It is a relatively large face on spiral galaxy that lies along the galactic plane and it is this view through the galactic plane that presents the rich foreground star field. The asymmetrical shape of NGC6946 may be the result of earlier gravitational interactions with nearby galaxies. Classified as a type Sc galaxy, NGC 6946 has well defined arms containing star clusters, Ha regions, and dust lanes. There is a lot of active star formation in NGC 6946. It is not clear what is causing this as there hasn’t been any recent interaction with other nearby galaxies. One thought is the spiral galaxy has a strong nuclear bar at its core. The bar shape is formed as the orbits of nearby stars become unstable and become elliptical. More and more stars follow this pattern and the bar shape becomes more defined. The formation of this bar is thought to induce star creation in the surrounding gas by concentrating it in the core area. NGC 6946 is also called the Fireworks galaxy. This is in part because of the high star formation rate but also because of the large quantities of supernovas. From 1917 to 2009 there have been nine supernova, by comparison our Milky Way galaxy averages one per century. There is also a large halo of gas that extends out from the galaxy disk and it is thought that this halo is the ejected neutral gas resulting from the high rates of star formation and supernova.